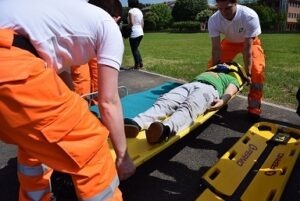 Have you suffered a serious spinal injury as the result of an accident? Neck, back & spine injuries can have a significant impact on an individual’s quality of life and often has a devastating effect on everyone involved. Our team of expert personal injury solicitors are here to help and advise. Simply call 01925 937070. Depending on the severity of the injury, the victim can experience anything from severe pain, difficulty performing daily tasks and complete incapacitation. Fortunately some injuries to the neck and spine can be medically treated, however for many patients the damage is often permanent. If you have suffered a serious injury to the neck, back or spinal cord in an accident which wasn’t your fault, you are likely to be able to receive compensation for the pain and suffering you are experiencing. At DSM Legal Solicitors we understand the complexity of each neck and spinal injury claim. Our specialist solicitors are able to offer legal advice to the highest professional standards and a genuine dedication to the needs and difficulties each victim and their families are going through. DSM Legal Solicitors have many years of experience dealing with injury claims involving the back, spine and neck and have been involved in many successful compensation claims over the years. Our friendly team of highly skilled specialist solicitors can offer you a unique, personal service, ensuring you deal with one solicitor who is on hand throughout the entire claims process and gives you the best advice. We can help with everything ranging from recovering lost earnings to arranging any recommended rehabilitation such as physiotherapy to ensure that you recover from your accident. If you have suffered from a neck, back or spinal injury as a result of an accident which wasn’t your fault, please give us a call today on 01925 937070 or fill out our online enquiry form to set up a free initial consultation. Our solicitors at DSM Legal Solicitors, are members of the Association of Personal Injury Lawyers (APIL). We are local Warrington solicitors – here to help. We accept claims from across England and Wales. Call us for a free, no obligation discussion or complete our Neck, Back or Spinal Personal Injury Claim Enquiry Form by clicking here. We can assist with personal injury (accident claims), road traffic accidents, medical negligence claims, employment law claims, settlement agreements, criminal injury compensation claims, wills and probate, lasting powers of attorney, oaths, affidavits and statutory declarations and professional negligence claims. A serious injury to the head and brain are often severe and can have a lasting impact on a victim’s quality of life, including work, education and family life. You can speak to one of our friendly expert serious injury solicitors on 01925 937070 for a free, no obligation chat. DSM Legal Solicitors has a team of specialist serious injury solicitors who are dedicated to helping victims of neck, back & spine injuries. We have the experience and knowledge to provide victims the legal support they need to get their life back on track. Begin your claim today by calling 01925 937070. Alternatively you can complete our Personal Injury Enquiry Form by clicking here. Our office in Warrington is minutes away from Junction 8 of the M62 and has free on-site car parking together with disabled access, including a lift. Please email info@dsmlegal.co.uk to arrange an appointment or telephone 01925 937070 to speak to a solicitor in confidence. If you, or a loved one has suffered a serious brain or head injury as a result of the negligence of a third party, please give us a call on 01925 937070 and we will be happy to discuss your claim today. Alternatively you can fill out our online application form. Spinal Injuries Association – a national charity dedicated to helping people with spinal injuries. Disabled People GOV.UK – the government’s website giving information on various matters such as benefits and rights. Aspire – supporting people who have been paralysed due to spinal cord injury. Download and print out DSM Legal Solicitor’s accident checklists. Our checklists provide a guideline of what details you need in order to help your claim achieve the highest amount of compensation.